While it does not support additional features such as scanning, the Xerox Phaser 7760VDX is a full-featured colour laser printer with a myriad of print features. It can produce high-resolution colour prints on paper sizes up to 11 x 17 inches, and it features an automatic duplexer for two-sided printing. Intended for offices that require the ability to print on larger paper, this printer will suit most office environments with its modern-looking design. Featuring built-in colour calibration tools, this device is ideal for design purposes. The Xerox Phaser 7760VDX printer measures 644 x 857 x 724mm and weighs 132kg. It is equipped with wheels to allow for easy movement. It supports connections via Ethernet and USB as standard. It also allows the addition of finishing options such as stapling, hole punching and saddle-stitch booklet making. 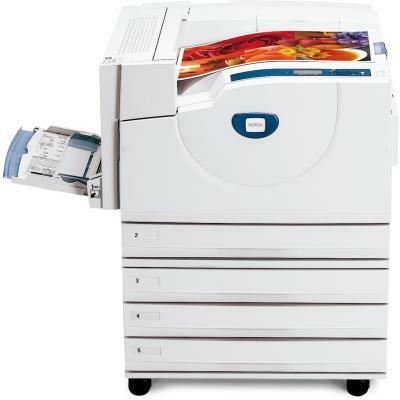 It is also Energy Star certified and uses a multiline LCD display and buttons for printer management. The Xerox Phaser 7760VDX printer has a maximum printing resolution of 1200 x 1200 dpi, and consistently produces clear, high-quality prints. It ensures that black text printed on colour has crisp, clean edges. It has a substantial standard paper capacity of 3,150 sheets and can hold a variety of paper sizes. It also features built-in colour calibration tools. Capable of printing everything from envelopes to tabloids, this machine can print up to 45 ppm in monochrome and 35 ppm in colour. With a maximum monthly duty cycle of 150,000 pages, this device is suitable for offices that print extensively. Lacking any faxing, scanning or copying capabilities, the Xerox Phaser 7760VDX printer may not meet all the needs of some offices. No longer sold as new, repairs can be difficult as replacement parts may be hard to find.